The Zillions package consists of the original Super Knights game which contained the Chancellor, Archbishop and Amazon. It also features two more sub-variations described below. The variation Quad Power! is like Super Knights Grand Chess except that the Amazon is replaced by another Archbishop, and each side can optionally drop 5 ninja pawns. In Super Knights 2, the Knights are replaced by the Ferz Knight and Wazir knight which make a diagonal step or an othogonal step respectively in addition to their knight jump. The board is setup as shown. 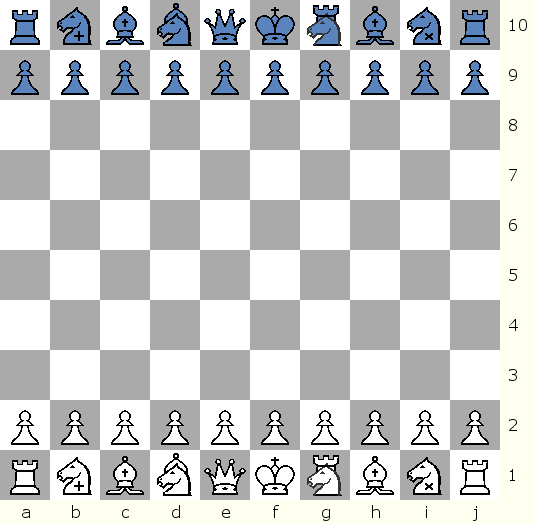 During play, 5 Ninja Pawns can be dropped into an empty space ( 1 per turn) on 2nd rank and optionally pushed forward 1 or more squares to the middle. The Ninja Pawn is a special pawn that can move/capture like a regular pawn as well as move 1 space sideways. When in enemy half of board it can also capture 1 space sideways. Super Knights Grand Chess . The original Super Knights with the Archbishop, Amazon, and Chancellor, as well as two more exciting and innovative games.